The Jaques company has been in existence since 1785 and has continued as a family business through seven generations during which time it has produced dozens of family games. 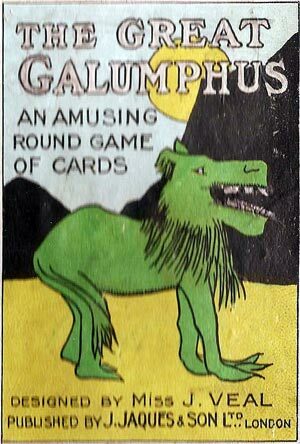 This “Great Galumphus” card game from the 1920s is printed in colour showing various comic animals with their names printed alongside. As can be seen from the box (shown right) the artwork was designed by Miss Jessie Veal. Four cards in the pack are Privilege Cards, marked with a black Star, to which certain rules apply in the game. Their names are: Crowned Cornubian, The Great Galumphus, Tasselled Snort Hound and Bubbling Water Hog. The remaining 44 cards (four each of 11 further designs) also depict imaginary animals which are reminiscent of the nonsense poems of Edward Lear. No doubt the children loved it! Pushfoot Polliwog, Climbing Chumtrunk, Painted Pooh-Pooh, Cissling Sand-Snapper, Hairless Hunkum, Flying Umbratunk, Long-Eared Scootler, Scru-Wuzzium, Lunar Lumpkin, Puttyfaced Popcat, Spotted Snifflegrub. 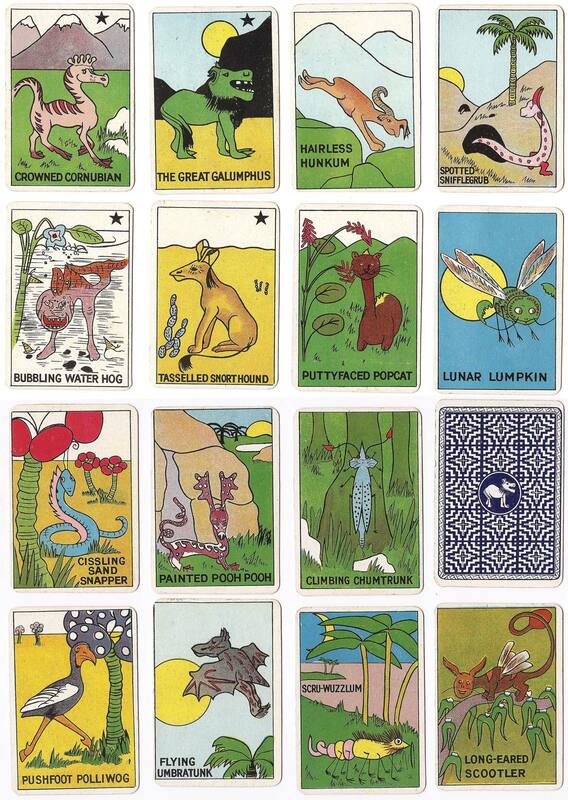 Above: The Great Galumphus card game published by J. Jaques & Son Ltd., London, 48 cards, 1920s. The reverse is a sort of tapestry pattern printed in dark blue with a Great Galumphus in the centre. Images courtesy John Bevin.